Measure 62, the proposed referenda to increase funding for NCAA sports, has been a hotly debated topic on campus over the past couple of weeks. This column is one perspective regarding the proposed fee measure. It took two days driving in two 11-seater vans in August heat to get to Spokane, Washington for the first three games of the season. When we stopped at a grocery store for dinner the first night, 11 of us raced toward the freezer section to cool off — the air conditioning in our van had broken within the first couple of hours of the trip. As a member of the UC Santa Cruz women’s soccer team, I am one of 267 NCAA athletes asking the student body to approve Measure 62 — the proposed student fee on this spring’s ballot of $117 a quarter that would save UCSC’s NCAA athletics and allow us to travel safely and effectively. We aren’t asking for first-class flights across the nation to get us to our games — we are asking for our programs to stay alive. We are asking that students don’t have to drive on long, late night road trips. We’re asking to stay in a hotel when we travel, instead of on the former recreation director’s couch, like we did last summer in Spokane. During four days of travel, we played three games. We hopped back in the vans packed with soccer balls and sleeping bags to drive 930 miles back to Santa Cruz. After one day of rest, we played back-to-back games in our only home tournament of the season. Most of my teammates didn’t complain about the travel, they were just happy to play the sport they love while wearing a jersey representing the university they love. But the university we love is unable, or unwilling, to fund us any longer. We are one of many student organizations and departments at this university that have to ask the student body to financially support the work we love to do — because the university won’t. In light of tuition hikes this year, it’s not looking great for any of the proposed referenda. For valid reasons, students are worried about increasing costs at the university — but the costs of NCAA athletics are also increasing. Since NCAA’s inception at UCSC in the 1980s, travel costs have increased because of the lack of Division III universities in California, along with the cost of maintaining facilities and operations. But the abysmally low student fee has stayed the same. Undergraduate students pay $5 per quarter through a student fee that passed in 2007. This fee contributes to the $1,430,000 operating expenses for athletics, $575,000 of which goes to salaries and benefits. Last year the university gave athletics $335,000 in permanent funding through 2016 to augment its large deficit. According to Executive Vice Chancellor Alison Galloway, the temporary funding increase isn’t sustainable with the budget situation and athletics must find alternative funding. “Athletics isn’t the end all, but it erodes the public’s perception. People would question the type of university that doesn’t have sports. If we’re a competitive university we should have sports that replicate the competitive nature of this campus,” said UCSC Athletic Director Cliff Dochterman. 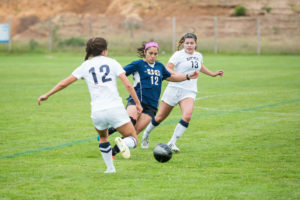 UCSC is unique in its sports programs because it is one of the only public Division III programs in the nation and the only one on the West Coast. One of the great aspects of Santa Cruz is the culture, and athletics is just one of the organizations on campus that facilitates the uniqueness of the campus and diverse student population. Under the Division III model, UCSC student-athletes are students first and athletes second. They receive no athletic scholarships or special privileges like priority enrollment. Student-athletes at UCSC have an average GPA of 3.3 and are going on five years of a 100 percent graduation rate. It’s upsetting the student body is asked to vote and fund this specific group, but we all fund different student organizations and programs on this campus that we don’t participate in. This is what the UCSC community is about and these organizations are what give the university a positive image. All the athletic teams at UCSC have felt this “life of a Slug.” Whether the challenge be grueling van rides in the summer months or early morning practices to get gym time, student-athletes at UCSC are dedicated to representing their school with pride no matter the situation. We are focused on getting a quality education and much of that includes the experiences and knowledge gained from playing the sports we love. It is up to us to create change and leave the type of legacy we want at this university.